← I support World Peace and Prayer Day. In the past the Welcome Back the Wakiya Oyate – Thunder Ceremony has always been done on March 21st, but because there is an International effort to respect the Mini wic’oni- the Water of Life – it was decided to unite our prayers and our energy, and to hold …the event on March 22nd, on United Nations Water Day. In the history of our People, this is the time to do our ceremony to Welcome Back the Thunders. This ceremony for our Nation – The Buffalo Oyate (Lakota, Dakota, Nakota), has always taken place in the Heart Of Mother Earth – The Sacred Black Hills at Harney Peak. Russell Eagle Bear and Ben Rodd have been the forefront for organizing this important ceremony for a long time. Each year many school bus loads of children, along with Elders and the People make this pilgrimage to offer prayers on top of Harney Peak. As the Keeper of the Sacred Bundle, I would also like to acknowledge the importance of the Sunka Wakan Oyate – the Horse Nation. When I was taught the teachings and history of the Bundle, the Elders told me that the Horse Ceremony came along with the original teachings – 19 generations ago. We pray to the West, the Horse Nation, who attends to this direction in order to bring rain. The main medicine of the rain brings life, health and well being, this is why water is called Mini wic’oni – Water of Life. Today the Horse Nation is being dismissed as having no worth any longer in this Society. There is no-where for them roam free and in places were they feel they have worth along with humans, they are being dismissed and replaced. Along with the Buffalo, they have been massacred, with no respect for their spiritual energy they give to this Turtle Island. 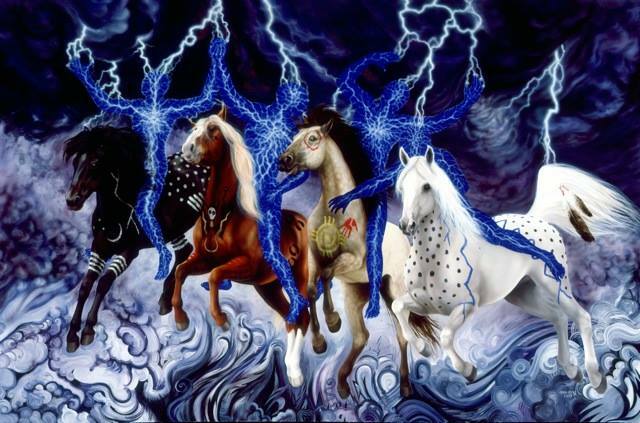 If the assault of the Horse Nation is allowed to continue: this disrespect can affect the blessings from the Wakiya Oyate (Thunder Beings). Today we are faced with many global challenges that affect the Mini Wic’oni in order for its medicine to be pure. We are at the time where these challenges can affect the survival of the generations to come; we need to pay attention. I humbly ask People of All Nations to open your hearts and minds to this important information of how all things are connected. The future generations and all life upon Mother Earth depend on you to offer your thoughts and prayers on this day with us. I will be in Grandmother Country (Canada) spreading this important information and joining all who hold these issues sacred. This entry was posted in Raven views and tagged Chief Arvol Looking Horse, World Peace and Prayer Day 2014. Bookmark the permalink.